Register Log In GliderCENTRAL Forums HELP! I'M NEW... Hey glider people! 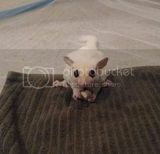 I am new to the forum and I have two sugar gliders, Luna and Sunlight. I may have some questions that I will post in this Forum. We are always glad to have new people in our little family. Ask away. Hope we can help.